(2013 'Delmark') 58:01/12 11 new original compositions ranging from straight ahead blues to funky soul to the psychedelic rocked out title track. Guitarist Lawrence Gladney and bassist Larry Williams return but this time around drummer Brian 'BJ'" Jones keeps the booty grooves shakin'. Reviews of Toronozo's first Delmark CD were overwhelmingly glowing. 'With consistently powerful performances from Cannon, a batch of compelling original songs, and the exemplary band work, Leaving Mood is a must-hear CD that should rank among the year's best.' 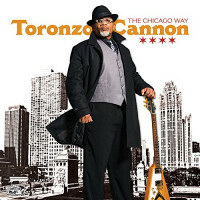 - Living Blues 'Southside Chicago native Toronzo Cannon is a genuine triple threat artist (guitarist / singer / songwriter) as he amply demonstrates on Leaving Mood.' 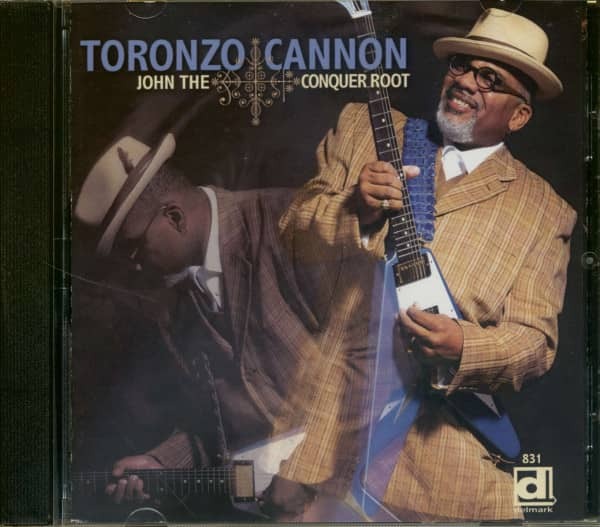 - Blues Revue John The Conquer Root features eleven new original compositions ranging from straight ahead blues to funky soul to the psychedelic rocked out title track. Guitarist Lawrence Gladney and bassist Larry Williams return but this time around drummer Brian 'BJ' Jones keeps the booty grooves shakin'. Awesome! #Growing Up On The Chicago's South Side, armed with the gift of gab and a people person demeanor, Toronzo Cannon wanted to be a social worker. A teacher accused him of wearing his feelings on his sleeve and young Toronzo figured he'd channel that sensitivity. Decades later. those same qualities have equipped him with the perfect skills for a mod-ern bluesman. 'I read, I look, I'm left-handed, and I'm obser-vant,' Cannon says of his standout songwriting and guitar playing. A CTA bus driver for over 20 years, his keen eyes and ears combine with his emotional awareness to turn bus-scene snippets, friends' situations, and personal experience into the kind of blues tunes that inspire repeat lis-tening. 'When I'm on the bus, I take notes at the red light,' he says. 'I have the notes for the guts of six songs in my pocket right now.- His off-kilter, left-handed perspective seems to supply his music with an unexpectedly fresh take that truly represents 21st century blues. However, being a bluesman wasn't even a con-sideration for Cannon until he started playing guitar at 22. Although he grew up in the shadows of the iconic Theresa's Lounge, with his uncles regularly joining the jam sessions, Cannon didn't realize those influences until much later. 'My uncle Ricky was a barback who some-times filled in for bands playing drums and my uncle Peewee was a ladies man who was always at Theresa's,- he recalls. 'Baldwin's Ice Cream was down the street and we'd go at night to get waffle cones and I'd lean over the banister [at Theresa's] and see my uncles. I'd hear the blues streaming out, but I didn't really know who was playing.' Between those late-night excursions and his grandfather's blues records. Cannon ab-sorbed a blues foundation that would later serve him well. 'I listen to a lot of blues stations on satellite [radio] and everyone seems to be singing about 'my woman left me,— he says, explaining his songwriting technique. 'I put in a lot more detail to make people flinch and say. 'Ooh, he's look-ing though my window.' I just take whatever the standard is and go somewhere else. I don't want to go in the same direction; it's too predictable. I ask myself, 'What would a left-handed, Aquarian bluesman do?— Apparently, such a bluesman would make sure that his music respected the past while salut-ing the future with modern-day observances. 'Shine', underscores the point by tackling death — that old blues trope — with an unex-pected treatment. A delicate ballad with three separate stories sung by Cannon's Chicago blues comrades Mike Wheeler and Joanna Connor, the song addresses suicide, biracial issues, and Armenian history in one well-structured swoop. 'I was thinking of three different ways that people die,' Cannon says of the inspiration for the song. 'I don't like my voice in certain settings, like a soft tone, so I asked Mike and Joanna to sing with me. I sing the last story about Armenians. I didn't know that they were the first Christians in a land full of Muslims. They got slaughtered, but it's not so much about religion as it is intolerance. I wrote the story about the biracial issues because I have a biracial daughter and Joanna has two biracial kids. There are three stories cutting into the next in one song. 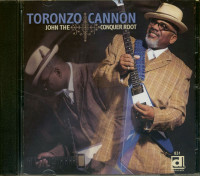 Cannon cites Jimi Hendrix as a major influence on his songwriting and fretwork. 'I used to watch old blues videos to observe how they played be-cause I think in images, and the blues is visual as well as audible. I'd watch videos of Muddy [Waters], Gaternouth Brown and Snooks Eaglin —this was before YouTube,' he says. 'Then I came across a video by the guy named Jimi Hendrix. It freaked me out: it hit me in my chest. It was beautiful to look at while you listened to it.' Cannon's dynamic stage presence clearly recalls Hendrix, but he also appreciates the '60s legend's wordplay. ''In Voodoo Child, (Slight Return) ', people listen and think it's all psychedelic, but dig the words,' he says. 'It was a revolutionary song; 'raising sand' is a Southern term for a fight.' 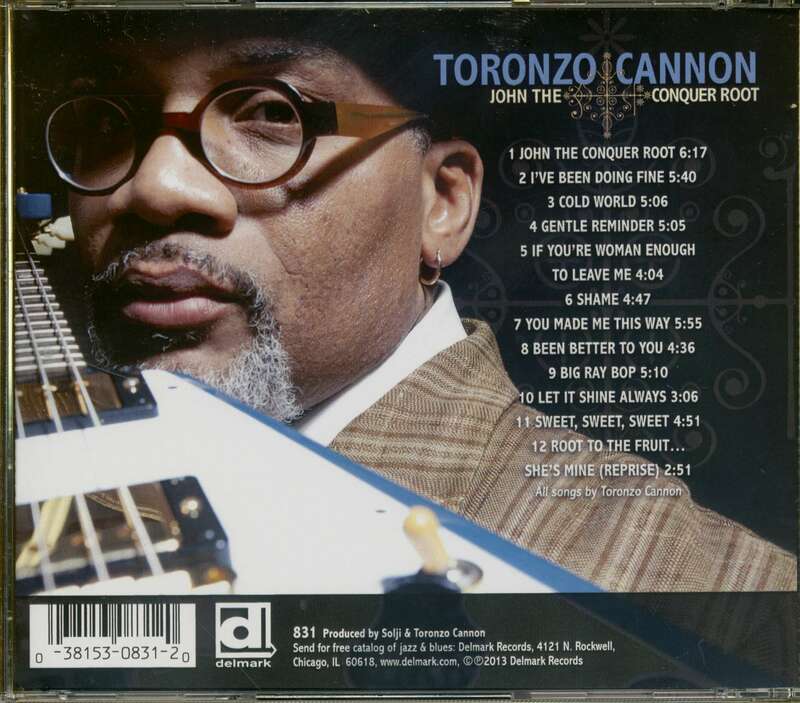 The cultural references and vivid imagery used by Hendrix and bluesmen before and after him are most prominent in the stunning title track of Cannon's album. 'John The Conquer Root' throbs with Delta heat and striking blues phras-ing. The stinging guitar. eerie harp playing, and haunting tale of working a spell with 'a piece of your hair in the palm of my hand,' echoes with the essence of the young blues upstart. 'Gentle Reminder' supplies fitting commentary on who Toronzo Cannon is and what he plays: 'I shouldn't have to say this/ but I'm a blues man through and through/ it's in my walk and my talk/ and the way I play my blues/...my friends say/ why you play the way you do/ I say the blues gotta move on/ this ain't 1952'. Thanks to his finely honed talents, the blues is indeed moving on, in an exciting direction. Évaluations de clients pour "John The Conquer Root"